Kirpal Singh is riding the slow train to Kashmir. With India passing by his window, he reflects on his destination, which is also his past: a military camp to which he has not returned for fourteen years. Kirpal, called Kip, is shy and not yet twenty when he arrives for the first time at General Kumar’s camp, nestled in the shadow of the Siachen Glacier. At twenty thousand feet, the glacier makes a forbidding battlefield; its crevasses claimed the body of Kip’s father. 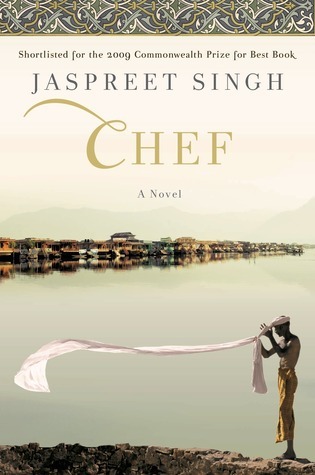 Kip becomes an apprentice under the camp’s chef, Kishen, a fiery mentor who guides him toward the heady spheres of food and women. In this place of contradictions, erratic violence, and extreme temperatures, Kip learns to prepare local dishes and delicacies from around the globe. Even as months pass, Kip, a Sikh, feels secure in his allegiance to India, firmly on the right side of this interminable conflict. Then, one muggy day, a Pakistani “terrorist” with long, flowing hair is swept up on the banks of the river and changes everything. This entry was posted in Books and tagged Books, Fiction, India, Jaspreet Singh by memoriesandsuch. Bookmark the permalink.